Eye Slam Concert #5 Enjoy Guinness at all Eye Slam Concerts. Leave a Creative Comment & Tag Your Friends To Get Listed For FREE! 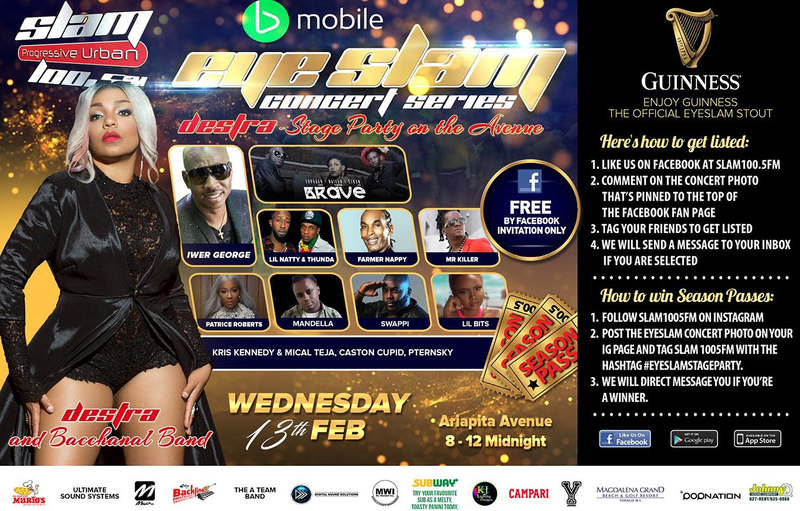 Concert #5 IEyeslam Stage Party on Ariapita Avenue courtesy Frankies Bar, Pub House & Johnny Q sound Company. We block the street from 8pm - midnight. You must be listed to gain entry. Featuring: Destra and Bacchanal Band, Iwer George, Erphaan Alves, Nailah Blackman, Sekon Sta, Lil Natty & Thunda, Farmer Nappy, Mr. Killer, Mandella, Swappi, Lil Bits, Kris Kennedy & Mical Teja, Caston Cupid, and Pternsky. 3. Slam 100.5FM will direct message you if you're a winner!